Beautiful spring flowers and biodiversity attract guests to the beautiful Namaqualand or Succulent Karoo around Fraserburg in the Northern Cape of South Africa. This arid zone turns into a colourful carpet of flowers after the first rains in spring. Explore the area that is full of cultural arte-facts of San and Bushmen. Visitors interested in astronomy will be fascinated by the clear night skies. The typical architecture with Corbal Houses or the Victorian style offers perfect photographic opportunities with wonderful scenery in the background. Enjoy absolute peace and stunning night skies in Fraserburg, a town in the Northern Cape of South Africa. It offers a very warm welcome and is one of the most authentically preserved Karoo towns in the Nuweveld Mountains. Visitors who make the journey to Fraserburg are special and treated as such by the townsfolk. It's about a 5 hour drive from Cape Town. The scenery is very different and quite beautiful and unspoilt. Visitors will find the air invigorating and can totally relax after the stress of the city in a variety of accommodation in and around this Northern Cape town. Stargazers will be amazed at the clarity of the night skies. Remote as the town is from pollution and city lights, this is a much sought after quality where every star shines brightly and great detail can be seen. This town is home to the South African Astronomical Observatory. Guests can have a closer look during a tour through this fascinating facility. Fraserburg lies about 120km (75 miles) east of Sutherland, also situated in the Northern Cape, the site of the coldest winters in the country.The San or Bushmen are the earliest known inhabitants. Traces of their cultural artefacts can be found here. The first European settlers arrived in the Fraserburg area circa 1760. Established in 1851 on the farm of Rietfontein, this town in the Northern Cape was named after the local minister Reverand Fraser and a Mr Meyburg, who was a church elder. The original manor house at Rietfontein is still in use today. The side streets of Fraserburg hist many Victorian-style houses. The homes are well preserved and have elaborate wrought iron ornamentation. The symbol of Fraserburg is the Pepper Pot, the only one in South Africa, a special building in the shape of a hexagon. The unique round Corbel Houses made from flat stones are a totally special feature in the Southern Hemisphere and can found on a farm called Driefontein in the Northern Cape of South Africa.Situated in the Namaqualand region of the Northern Cape of South Africa, Fraserburg forms part of the Flower Route. From July to September Namaqualand comes alive with flowers of every shade in a riotous display of rainbow colours and tones a delightful spectacle of Natures brilliance. Visitors of this Northern Cape province can take a wonderful journey through the Succulent Karoo, a veritable hotspot of biodiversity, the only one of its kind in the world. It comprises of more than 6 000 plant species, 250 bird species, 78 mammal species, 132 reptile and amphibian species as well as innumerable insects. This South African region is the world's most diverse, arid environment. Nearly half of the species that live here cannot be found anywhere else on earth. The Riverine Rabbit is an endangered species and very rare. De Postjes Trail for hiking, biking and 4x4, walking trails. 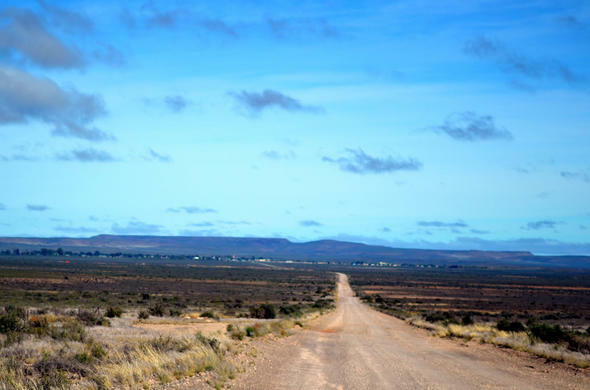 The Karoo earns its name from the Hottentot for 'thirstland'. And so it may seem at first. Two hours north-west of Cape Town, the Great North Road presents the uninitiated with a vast and inhospitable dryness. San Bushmen are the ultimate survival experts and know exactly where to find water-filled tubers in the sand or how to catch an ostrich - which is no easy task!